Many thanks to all those who came to our annual Mass of Thanksgiving for Volunteers on Saturday at Our Lady Help of Christians Church Farnborough. It was lovely mass in which we thanked God for all our CAFOD volunteers in the South East region which includes Arundel and Brighton, Brentwood, East Anglia, Portsmouth, Southwark and Westminster dioceses. Celebrating our Volunteers with Mass then tea and cakes. Our thanks for presiding at the Mass go to Fr Marco Villani who is the chaplain at the Salesian school in Chertsey and very involved in our CAFOD Youth Leadership programme. Our thanks also to Fr Chris for hosting the mass and to Helen Priestley our parish volunteer at Our Lady Help of Christians for providing a delicious afternoon tea. Tania Dalton, who is the communications officer for Latin America spoke very movingly about our work in Latin America. She told us how CAFOD supports the region such as helping fund a local radio which is a life line for people living in rural communities as it gives them information about weather, farming techniques and supports them in their struggle for human rights. Many thanks to Tania for her inspirational talk and for those who came to join us in our celebration of volunteers and the support they give us in our mission of transforming the world to reflect the Kingdom of God. On Saturday the 16th June at 2pm, we will be holding a Volunteer Celebration Mass for the South East of England. This will take place close to our diocese at Our Lady, Help of Christians Parish in delightful Farnborough. We will serve refreshments after and hear from Tania Dalton from our Latin America Team then hopefully, depending on the weather go on a short ‘Share the Journey’ taster walk. During the Mass itself, Martin will be playing music but would love it if there were other musicians who wanted to join in – just let us know. Do join us to celebrate the marvellous contribution of our volunteers to our work in the diocese and around the world. Our Lady Help of Christians, Farnborough, 2pm. 1A Sherborne Rd, Farnborough GU14 6JS. All welcome, please bring friends and family to help this be a wonderful Mass. 11,000 people gathered in our Diocese on the 5th of July to celebrate our diocesan 50th anniversary, how did you find it? I was struck, not only by the number of people but also by number of organisations, like ourselves, who are making a difference in the world, locally, nationally or globally. It reminded me that the church isn’t just a club for people to join but a world-changing force. It isn’t a place to go on Sunday, but a living, dynamic body at work. It isn’t just a collection of people, but a community of disciples, following in the footsteps of Christ on our pilgrimage, loving God and loving our neighbours as ourselves. 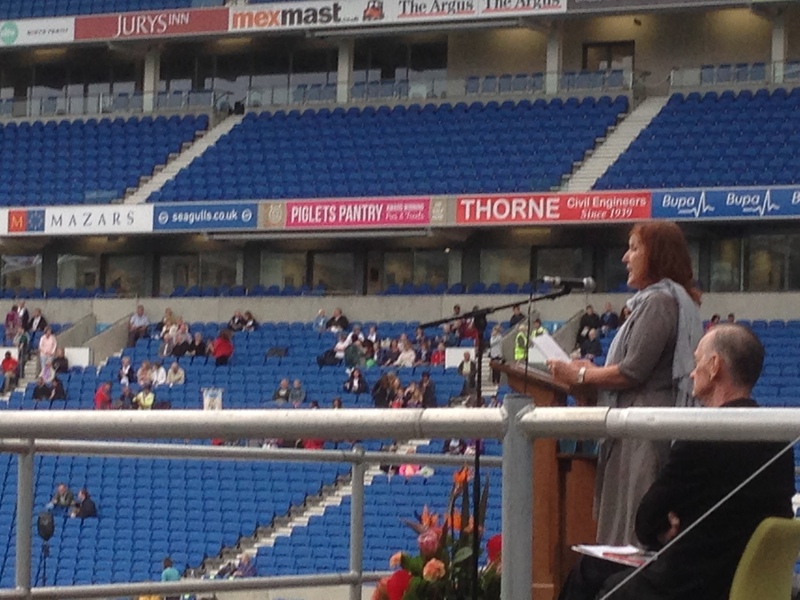 From the main stage were delighted to hear from Clare Dixon, CAFOD’s Head of Latin America and the Caribbean, who reminded the ever-increasing crowd of the witness of people who have gone before us, not least Blessed Oscar Romero and Fr John Medcalf from our diocese. ‘To be a poor church for and with the poor, to care for the earth and all creation: are strongly rooted in the tradition of St Francis’ said Clare who was featured with Bishop Dan of our sister Chulucanas Diocese in a session chaired by the amazing Fr Kevin Dring. Many people spent a lot of time investigating the many stalls of the festival. Our main stall had a good number of visitors but we soon sent a mini-stall up to the diocesan showcase where there were many more people – it was, after all, in between two major food outlets. The presence of so many stalls, so many people making a difference in the world was very inspiring. We met many people, had a great many conversations and put many names to faces, thank you for coming to say hello. We also distributed various fliers, postcards and Catholic Climate Change petitions. Our great thanks to all our volunteers who helped out on the stall – Jonathan, Ann, Kevin, Alastair and Stephen, we couldn’t have spoken to all the people we reached without your help. Jon and Pierre on the stall. Thanks to all who helped out. Colleagues from Romero House, CAFOD’s Head Office, joined us for the day including Ian Farthing – Head of Fundraising, Maria-Elena Arana – Campaigns Outreach Coordinator and A&B’s own Pierre Fernandes. Heavens Road Radio interviewed Ian and Maria-Elena so we look forward to hearing those programs. John Watts led a strong troupe of Redshirts in song which even included a special dedication to CAFOD with the original song ‘Your Spirit oh Lord is on Me’. This was especially fitting as the chorus reads ‘And Your Spirit oh Lord is on Me, saying “Whatever you do to the least of my brothers and sisters you do to me. *’ Our thanks go to John and the Redshirts. The day culminated in the Mass which was a delightful end to the day. Some sheltered from the sun while others, like me, enjoyed its full warming glory. Being part of an eleven thousand-strong congregation isn’t a normal experience for most of us and I’m sure it inspired many. After the festival when life has returned to normal I am left wondering about the next fifty. The last fifty years have seen a lot of changes and I’m in little doubt the next fifty will see more. But change can be positive or negative, which will they be? Based on the people that I met at Festival 50, I think that change will be largely positive. 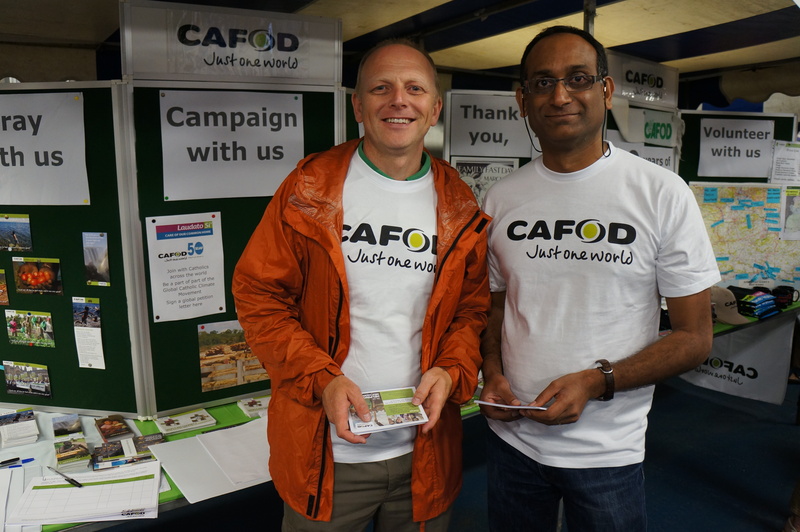 I know that every CAFOD volunteer helps change the world such that poverty is reduced, countless people can live fuller lives and we can live in a more just way. Without doubt there are many more out there doing similar things. Thank you for your support these past fifty years, please contact us if you would like to volunteer or support us in any other way during the next fifty. bringing freedom where there was captivity before. To give sight to the blind and to set people free. And your Spirit now Lord is on me. Saying whatever you do to the least of my brothers and sisters you do to me. With the good news of your Kingdom for all. All that we need will be given to us. And his Spirit is now upon us.